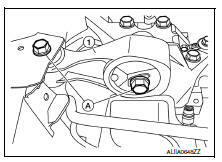 Remove the upper torque rod bolts (A) and the upper torque rod (1). 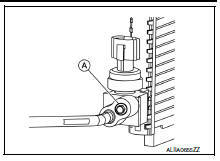 Remove the washer tank inlet bolt (A), then pull the washer tank inlet (1) up and out of the washer tank. 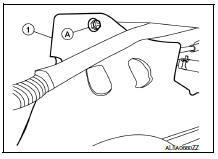 Remove the engine ground bolts (A) and the engine ground (1). 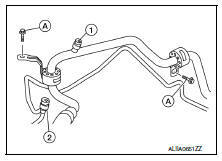 Remove the A/C pipe bracket bolts (A). 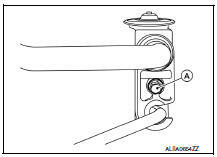 Remove the push nut (A) from the expansion valve insulator (1) and reposition. Remove the bolt (A) that retains the high-pressure pipe and lowpressure flexible hose to the expansion valve, then disconnect the low-pressure flexible hose from the expansion valve and high-pressure pipe. Remove the front under cover. 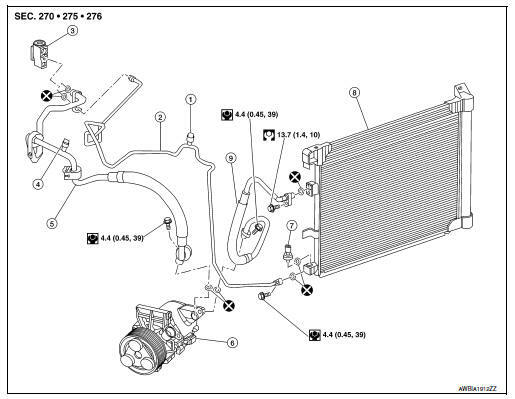 Refer to EXT-31, "ENGINE UNDER COVER : Removal and Installation". 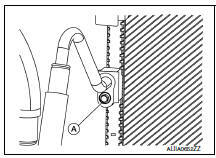 Remove the bolt that retains the high-pressure flexible hose to the compressor, then disconnect the highpressure flexible hose from the compressor. 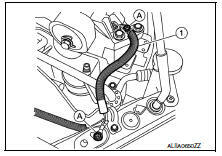 Remove the bolt that retains the low-pressure flexible hose to the compressor, then disconnect the lowpressure flexible hose from the compressor. Remove the low-pressure flexible hose. Apply A/C oil to the new O-rings. Remove the core support upper cover. Refer to HA-39, "Exploded View". Remove the high-pressure flexible hose. 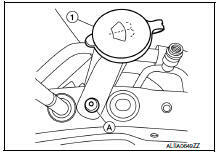 Apply A/C oil to new O-rings. Remove the low-pressure flexible hose. Refer to HA-35, "LOW-PRESSURE FLEXIBLE HOSE : Removal and Installation". Cap or wrap the joint of the pipe with a suitable material such as vinyl tap to avoid the entry of air.